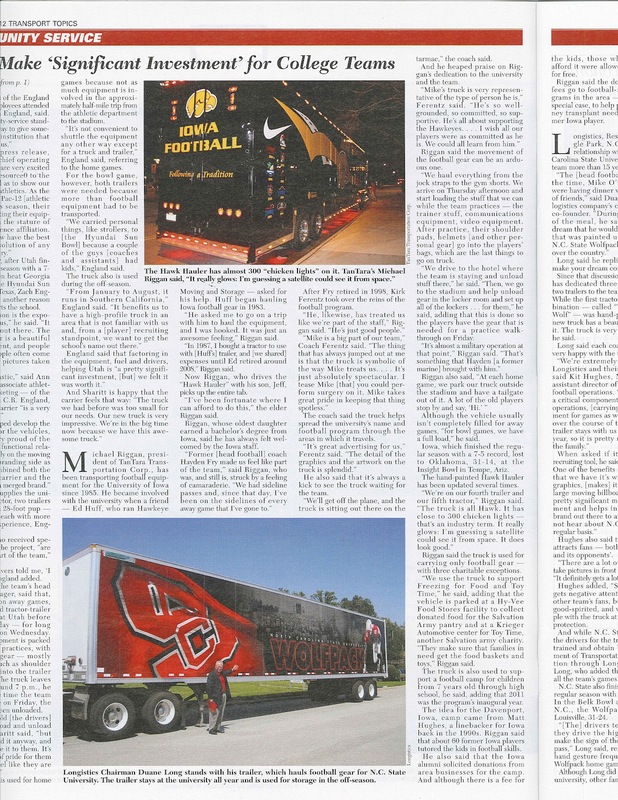 TRANSPORT TOPICS has a great article on fleet customers hauling gear for free, Iowa Football is one of the benefactors of such a deal. Michael Riggan, president of TanTara Transportation Corp., has been transporting football equipment for the University of Iowa since 1985. He became involved with the university when a friend — Ed Huff, who ran Hawkeye Moving and Storage — asked for his help. Huff began hauling Iowa football gear in 1983. “He asked me to go on a trip with him to haul the equipment, and I was hooked. It was just an awesome feeling,” Riggan said. “In 1987, I bought a tractor to use with [Huff’s] trailer, and [we shared] expenses until Ed retired around 2008,” Riggan said. Now Riggan, who drives the “Hawk Hauler” with his son, Jeff, picks up the entire tab. “I’ve been fortunate where I can afford to do this,” the elder Riggan said. Riggan, whose oldest daughter earned a bachelor’s degree from Iowa, said he has always felt welcomed by the Iowa staff. After Fry retired in 1998, Kirk Ferentz took over the reins of the football program. The coach said the truck helps spread the university’s name and football program through the areas in which it travels. “It’s great advertising for us,” Ferentz said. “The detail of the graphics and the artwork on the truck is splendid.” He also said that it’s always a kick to see the truck waiting for the team. “We’ll get off the plane, and the truck is sitting out there on the tarmac,” the coach said. And he heaped praise on Riggan’s dedication to the university and the team. Riggan said the movement of the football gear can be an arduous one. “We haul everything from the jock straps to the gym shorts. We arrive on Thursday afternoon and start loading the stuff that we can while the team practices — the trainer stuff, communications equipment, video equipment. After practice, their shoulder pads, helmets [and other personal gear] go into the players’ bags, which are the last things to go on truck. “We drive to the hotel where the team is staying and unload stuff there,” he said. “Then, we go to the stadium and help unload gear in the locker room and set up all of the lockers . . . for them,” he said, adding that this is done so the players have the gear that is needed for a practice walk-through on Friday. Riggan also said, “At each home game, we park our truck outside the stadium and have a tailgate out of it. A lot of the old players stop by and say, ‘Hi.’ ” Although the vehicle usually isn’t completely filled for away games, “for bowl games, we have a full load,” he said. Iowa, which finished the regular season with a 7-5 record, lost to Oklahoma, 31-14, at the Insight Bowl in Tempe, Ariz. The hand-painted Hawk Hauler has been updated several times. Riggan said the truck is used for carrying only football gear — with three charitable exceptions. “We use the truck to support Freezing for Food and Toy Time,” he said, adding that the vehicle is parked at a Hy-Vee Food Stores facility to collect donated food for the Salvation Army pantry and at a Krieger Automotive center for Toy Time, another Salvation army charity. “They make sure that families in need get the food baskets and toys,” Riggan said. The truck is also used to support a football camp for children from 7 years old through high school, he said, adding that 2011 was the program’s inaugural year. The idea for the Davenport, Iowa, camp came from Matt Hughes, a linebacker for Iowa back in the 1990s. Riggan said that about 60 former Iowa players tutored the kids in football skills. He also said that the Iowa alumni solicited donations from area businesses for the camp. And although there is a fee for the kids, those who couldn’t afford it were allowed to attend for free. Riggan said the donations and fees go to football-related programs in the area — and in one special case, to help pay for a kidney transplant needed by a former Iowa player.